You have just been tasked by senior management to develop capacity management capabilities for your organization. You are very familiar with managing day-to-day IT infrastructure activities, however when it comes to Capacity Management, you are one of the many uninformed professionals. 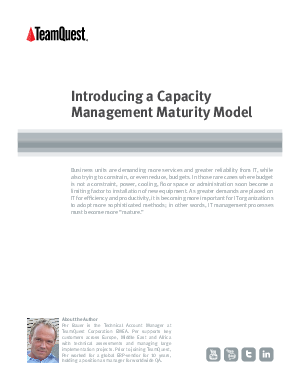 Although Capacity Management has been in existence in one form or another for over 40 years, only a minority of shops have chosen to implement it. With constantly lowering prices, many IT shops have chosen to throw hardware at performance and capacity problems rather than spend the time to manage what they have. In the past, that approach has worked, however times and management challenges have changed and costs increased; demanding a different approach. Capacity Management is one solution. This guide is designed to help those managers who are now looking to assemble a Capacity Management organization and put in place the processes and best practices to make it successful.